If you’re of a certain size then getting the right equipment can be a challenge, and that includes getting the best wakesurf board for big guys. You need to make sure the board is wide enough to have a high amount of stability and that it can also support your weight. 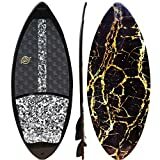 What is the best wakesurf board for big guys? In terms of you having an all-around performance, then the ​​ Hyperlite Landlock Wakesurfer is going to be a great option for you. It has the performance that you need but also the support too. 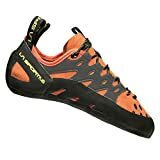 There are still a few other great options out there though, for those looking for a great product. There are different shapes and designs available for those wanting something a little different. Here ​I will explain everything so you can make the best choice for you. What's the best way to use a wakesurf board? ​Th​e ​ Hyperlite Landlock Wakesurfer is a board that has a high level of styling and design in order to give you a high level of support. The EVA traction pad is going to make it very comfortable to use and also allow you to keep your balance while you are standing on the board. The rolled edge profile is going to be able to give you a good amount of control. This wakesurf​ board has a monocoque construction which integrates both sides of the board. That gives it a huge amount of durability to ensure that it lasts for years.It will also help it to prevent damage from any side impacts and also delamination. 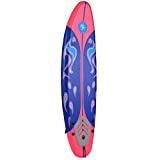 It’s a great board with a very stable construction, together with a high level of weight capacity which makes it an ideal board for big guys or gals. ​Th​e ​ CWB Connelly Ride Wakesurfer is a board that has an impressive level of quality. 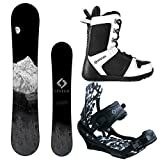 It is a board that is going to be ideal for both beginner​ and intermediate levels of expertise. That is ​due ​to, not only ​its g​reat design but also the stable base that it’s able to provide which is great for ​heavy surfers. The surf design is going to allow you to ride those waves comfortably. It is very well made with a compression construction which contains a polyurethane resin core. That gives it excellent performance but also a great amount of durability too. Along with that, it also has a 2-piece EVA pad for a high amount of comfort and three 1.75 tails fins that are going to allow you to have the control that you need. It also features a stylish design that is going to look great while you’re out there on the water. 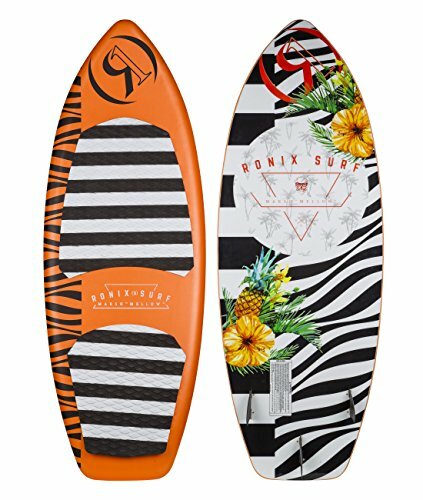 ​Th​e Ronix Marsh Mellow Thrasher Wakesurfer is a wider board which is going to be ideal for those looking for the maximum amount of stability. 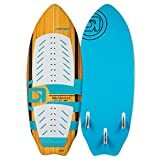 For anyone who is looking to get into wakesurfing, this is going to be an ideal product and it’s perfect for big guys too. It has machined EVA concave pads that are going to give you a great level of arch support and also an extra tall tail kick. There are also air vents that are inserted into the EVA pads that are going to give you the highest level of comfort. The board is going to give you a high level of weight capacity which will mean that you can comfortably stand on the board. The design is also bright and colorful. 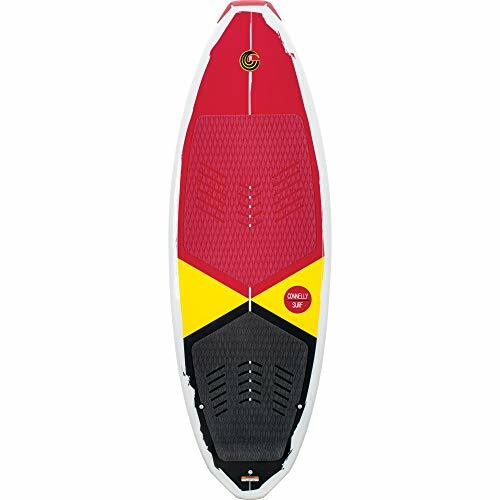 It’s an all-around board that ​will give you a great amount of fun while of the water. Everything has its own level of buoyancy. That means that there is an amount of weight that ​a board is going to be able to hold while it’s on the water. You want to make sure that ​your wakesurf board will be able to cope with your weight before you buy it. All the boards looked at here are going to be able to give you some great level of support. That will allow you to wakesurf in confidence. Not all products are going to be suitable for big guys and therefore it’s important to be vigilant. As with all products, it’s important to use the best materials that you can in order to not only have a good level of performance, but also have a great level of durability too. There is usually a core which is surrounded by a fiberglass layer. Fiberglass is often used for these types of products as it is not only a durable material but also allows it to be very light too. You also want to have an EVA traction pad as this is not only going to be comfortable but it will also ​provide you great balance too. 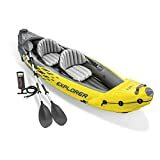 There’s not a great difference in the design of these products as they need to have that standard shape that is going to allow you to ride over the waves. Some are a little different though and one significant area is the number of fins that they have. For beginners, you would want to have three fins as this is going to be able to give you the highest level of control that you can possibly get. Having the option to remove fins, though, is important, as you start to get more comfortable on the board and raise your level of expertise. ​Different sizing ​is available with these boards, both in their length and also their width. A wider base is generally going to give you a higher level of stability as there is less chance of the board tipping over at any point. Though​ this has to be taken into consideration, as you also ​have to make sure that it has a high level of agility and fun. All the boards reviewed here make a good compromise and will allow you to still have a high level of enjoyment but keep you on the board. Wakesurfing is a very fun activity and we have seen that there are now many great companies ​that are making boards specifically for the job. Riding on those waves takes quite a bit of practice but once you are used to it is a thrilling experience. In terms of speed, it’s a good idea to hit a spot that is between around 9 to 12 mph. This will be able to give you a good amount of wake while not being too out of control. It’s important to get a good wake in order to have the best time on the water. Getting on the board can actually be one of the most difficult parts of the task. It starts by you lying down on the water with the board loosely under your legs with bent knees while you are holding on to the rope. The ​boat gradually speeds up. Here, you then need to dig your heels into the bottom of the board which will make it stand up. From here it’s a very similar process to getting up from the floor when someone pulls you up. 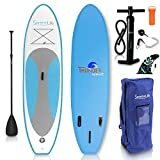 Aside from your board, there are also a few other essential items that you are going to need to have. The rope is obviously important and you want to make sure that you are getting ​one that is going to be specific ​for the job. You also want to check that you have the right ballast for your boat too. You ideally want the back of the boat to be heavy as this is going to be able to give you the best possible wake. From here you will be able to go from beginner to expert, as long as you keep practicing. 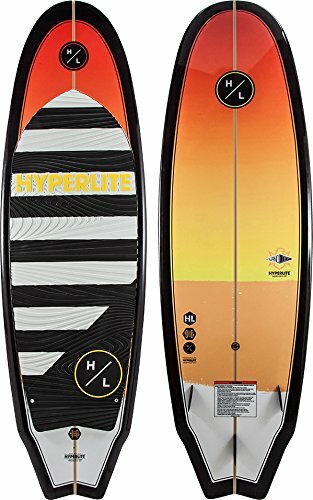 In terms of the best wakesurf board for big guys, for me it has to be the ​ Hyperlite Landlock Wakesurfer. 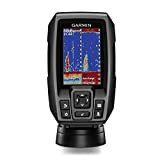 It’s a testament to the amount of quality it has, ​which has been so highly rated by those who have used ​it over a long period of time. All the products that we have looked at here have a great level of quality, but this one in particular is great for big guys or gals. It is able to give you a great level of control while also supporting your weight. It is also made from great materials to give you huge confidence in the durability of your board.